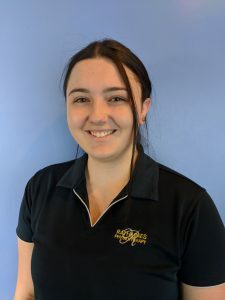 Nicola Windus graduated from TAFE NSW, Tighes Hill campus in 2016, with a diploma of Remedial Massage. During that time she was able to build up her clinical skills by participating in a TAFE program with the Newcastle Knights under 21s team, assisting with pre game preparation and post game recovery. Nicola has always been interested in how the body and muscles function due to her keen interest in netball growing up, playing in the local Representative team since she was in under 12’s. Because of this, one of her special interests is the preparation and recovery of athletes before and after events through massage. Nicola also had the opportunity to head off to State Age netball with Westlakes Netball association 2018 to help with the recovery of the teams after each of the three days of competition. In her spare time, Nicola enjoys swimming at the beach, kayaking and walking her dog Bear.